Spring has sprung and the CWF Demonstration Gardens are waking from their winter slumber. 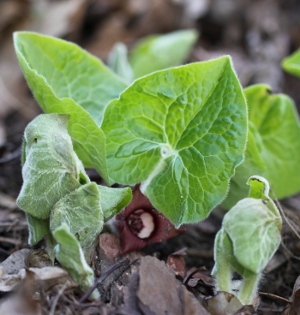 Our wildlife-friendly garden showcases a large variety of Canadian native plants and through this blog we’ll be featuring the weekly bloomers and more! 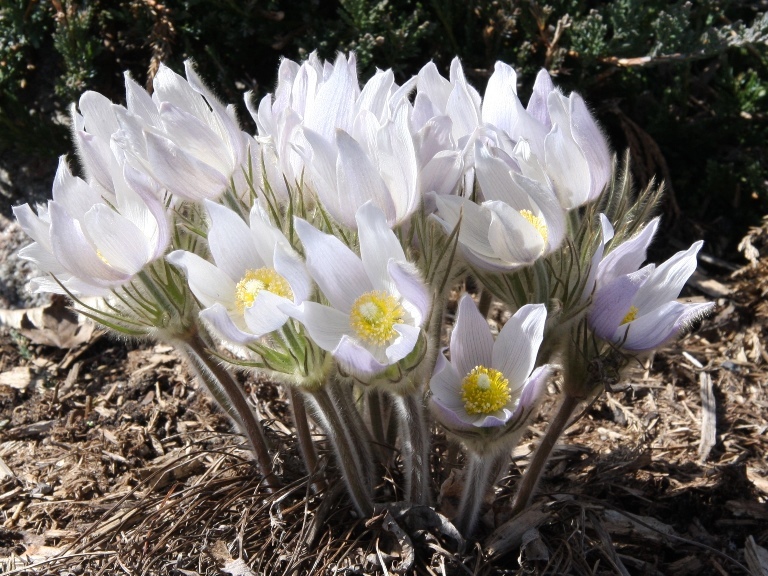 The first to flower was our pasque flower (aka prairie crocus), which had blooms at Easter just a week or so ago. 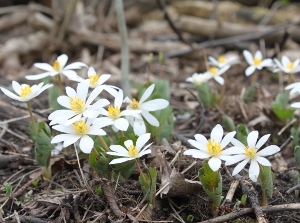 It was soon followed by hepatica. Both plants have gorgeous soft white down all over, which protects them from the cold of early spring. They are still in bloom and joining them are several others. See below for this photographic update, taken by yours truly, along with Melissa Lefebvre who cared for our gardens last year and will do so again this year. I like to help myself remember what-plants-bloom-when based on some standard plant or sound anyone might see or hear. Right now, the non-native but ever popular shrub forsythia is in full bloom and I’m seeing more and more dandelions show their bright yellow heads. 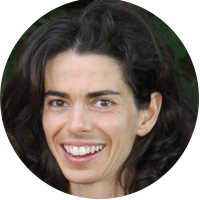 (Stay tuned for ideas on dealing with dandelions in your lawn!). Also, the spring frogs have been calling for a few weeks now and we’re still fairly bug-free. 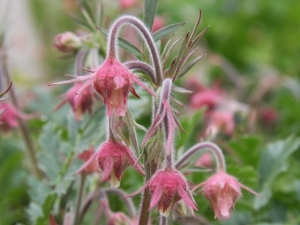 Prairie smoke is such a neat plant. It is low growing in clumps – if you get down low, you can appreciate its beauty even more. 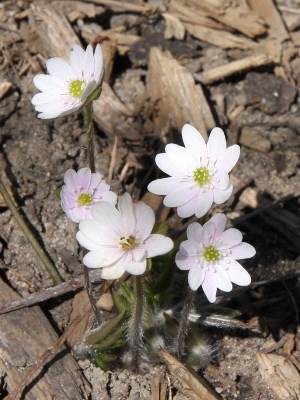 Hepatica flowers can be white, pink or purple. Bloodroot from the side shows their large leaves getting ready to uncurl. 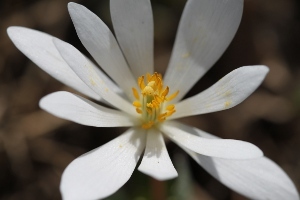 The bloodroot flower is so beautiful, I had to share this close up! 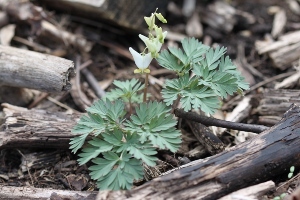 Dutchman’s breeches is one of those spring ephemerals, like hepatica and bloodroot and many others. They make use of the spring sunlight before the leaves of forest trees fully open. 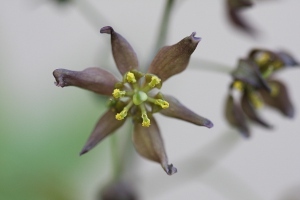 Blue cohosh flower close up. 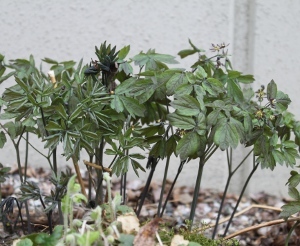 Blue cohosh overall, after most of the leaves have unfurled. A week ago they were dark purple stems with small folded leaves. That’s the stage their cousins, the black cohosh, are at right now. Our wild ginger, a neat ground cover. Some leaves are open while others are only just popping up above ground. Can you spot its flower? It is said to smell like rotting meat, to attract a certain beetle. But I’ve never been able to smell anything! Other flowering plants include our trees! Some types of willows are already dropping their flowers while others are in full swing, like some maples and poplars. 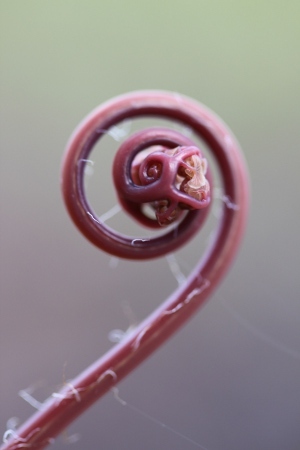 This royal fern is distinct with its cobweb-like mass of down. See the young leaves? They remind me of a young baby curled up in a mother’s womb. If you see thin red stems poking up on the forest floor, look closely…they might be the new shoots of a northern maidenhair fern. 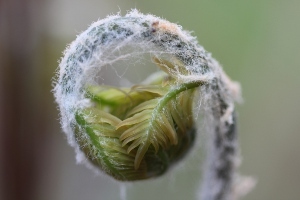 Many other plants are getting ready to flower, such as Virginia bluebells, mitrewort, mayapple and shrubs like red-berried elder and nannyberry. 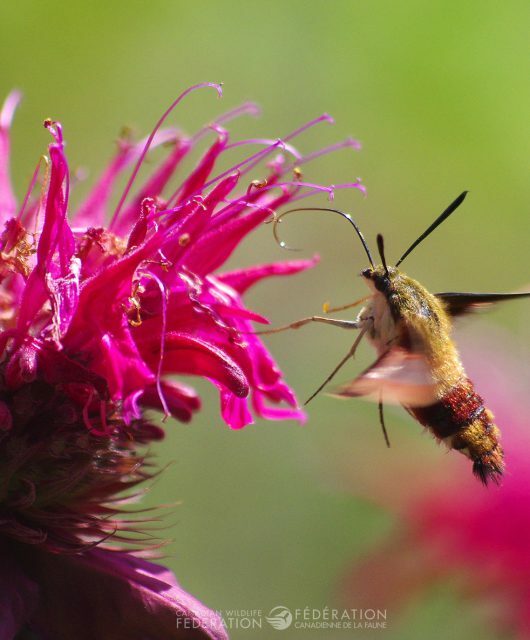 Check in next week to see them and more and visit our Native Plant Encyclopedia or our wildlife-friendly demonstration garden for more ideas and information.